IN THE NAME OF DEMOCRACY is a feature documentary about the remarkable case of Lt. Ehren Watada, the first officer in the US Army to refuse to deploy to Iraq on moral grounds. The film delves into the lead up to and US entry into the Iraq war, and features Lt. Watada, his parents, his attorney, Col. Ann Wright and Gen. Wesley Clark. Like David and Goliath, Lt. Watada courageously stood up to the military-industrial complex. The film raises significant questions about current American policy in Iraq and Afghanistan. ZAHIRA'S PEACE is a feature documentary, broadcast nationwide on Canal +/Spain, on the first anniversary of 3-11, tells the courageous story of Zahira, a young woman gravely injured in the Madrid train bombing, her family and her friends, who embrace the political changes that took place in Spain following those tragic events. CODE YELLOW: HOSPITAL AT GROUND ZERO is a feature documentary, produced in association with NYU Downtown Hospital, narrated by Brian Dennehy, and written by Dennis Watlington and Dr. Antonio Dejar, which tells the story of the remarkable medical response of the hospital closest to Ground Zero on 9/11. UNINTENDED CONSEQUENCES is a widely seen short focusing on the draconian impact of the Rockefeller Mandatory Minimum Drug Laws on families and communities in New York City as we follow the "The Mothers' of the New York Disappeared", who protest to change these unjust laws. Judge Jerome Marks kisses Terrence Stevens on the day of his release from prison by executive clemency. Sentenced under the Rockefeller Drug Laws, Mr. Stevens, paralyzed from the neck down since childhood by Muscular Dystrophy, served 9 years of a fifteen to life sentence. SLY & JIMI: THE SKIN I'M IN is a feature documentary about the music of Jimi Hendrix and Sly and the Family Stone featuring Rose and Freddie Stone, Sly Stone's mother, and band members Cynthia, Jerry, Larry, Gregg and David Kapralik, Manager of Sly Stone and his partner. NY Times' Jon Pareles provides the on camera music history context. 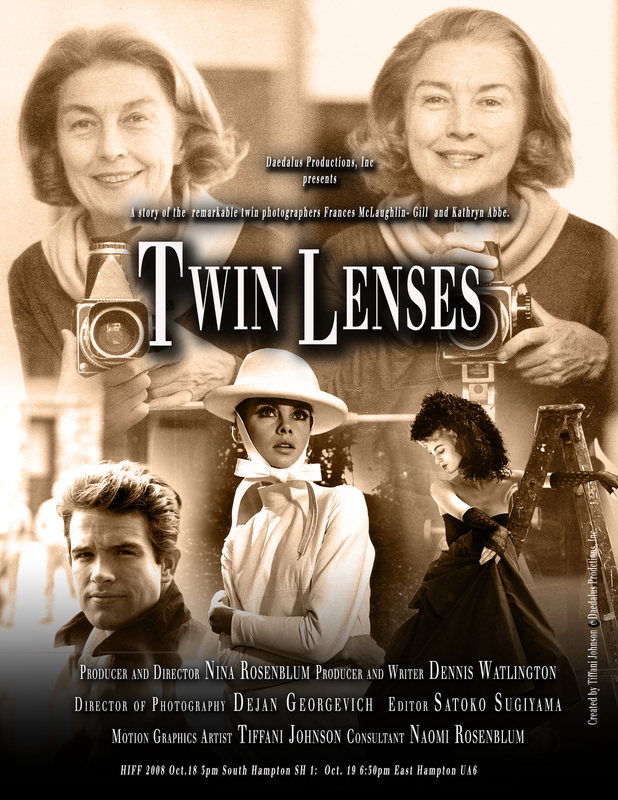 TWIN LENSES is a feature documentary about the pioneering twin fashion photographers Frances McLaughlin Gill (the first woman photographer on the staff of Vogue) and Kathryn Abbe, now in their eighties, who were both married to famous photographers and worked in the glamorous world of fashion and editorial photography in NYC in the forties and fifties. 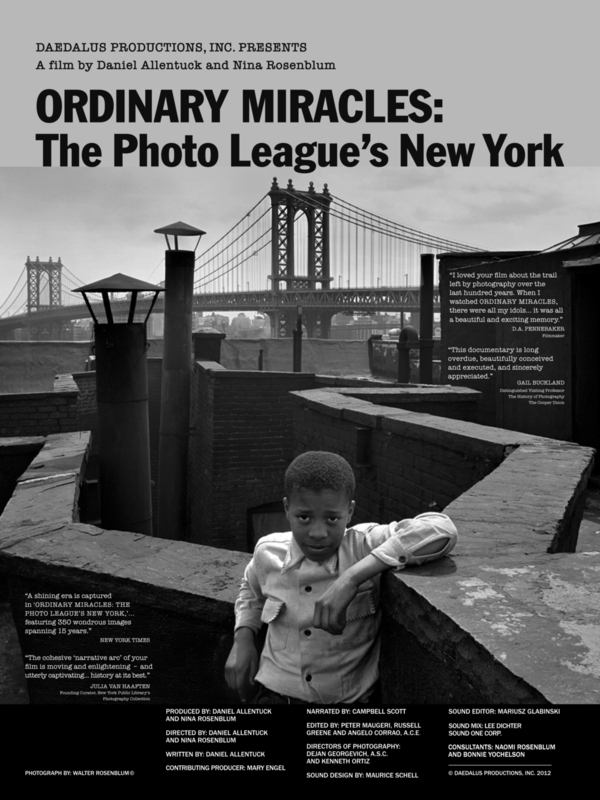 WALTER ROSENBLUM: IN SEARCH OF PITT STREET is an hour-long documentary about the renowned photographer Walter Rosenblum, whose photographs of D-Day, Pitt Street, Spanish Refugees, East Harlem, Haiti, Europe and the South Bronx are a recognized part of our national heritage. A HISTORY OF WOMEN PHOTOGRAPHERS is a fifteen minute historical short which was installed in four venues with a traveling museum exhibition: A HISTORY OF WOMEN PHOTOGRAPHERS 1839-1974, curated by Naomi Rosenblum. 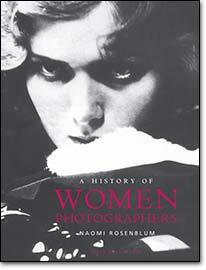 For the first time, the story of history of photography focuses on the decisive contribution of women photographers, in an exhibition and book by Naomi Rosenblum, an internationally renowned historian of photography, and author of A WORLD HISTORY OF PHOTOGRAPHY and A HISTORY OF WOMEN PHOTOGRAPHERS. 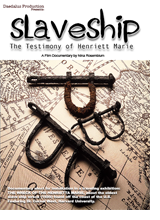 SLAVE SHIP: THE TESTIMONY OF THE HENRIETTA MARIE is a documentary short commissioned for installation in a traveling exhibition: THE WRECK OF THE HENRIETTA MARIE, about the oldest slave ship wreck (1699) found off the coast of the U.S. featuring Dr. Cornel West of Harvard University. 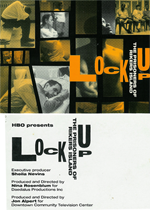 LOCK-UP: THE PRISONERS OF RIKERS ISLAND profiles the world's largest jail. With 20,000 inmates, it is a city within a city. The residents of Rikers are NYC'S poorest - their crimes include drugs, prostitution, pick-pocketing and murder. Most are awaiting trial or sentenced to one year or less. Painting an uncompromising picture of America's "criminal justice" system, this gripping documentary will provoke serious discussion about our society's distribution of resources. 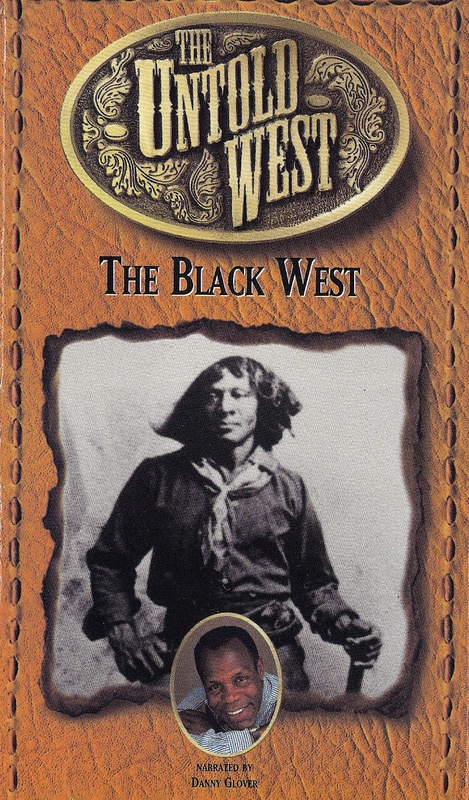 THE UNTOLD WEST: THE BLACK WEST is part two of a three-part series, written and co-produced by Emmy winner Dennis Watlington, which tells the unknown story of African-American cowboys, rodeo riders and Hollywood's Black Western movies. The conquest and settlement of the West is told through the stories of fleeing slaves, fugitives from the south running towards freedom. Told by rare archival photographs and documents from the time, assembled with testimony from Herb Jeffries, a star and producer who made some of the first Black cowboy movies in Hollywood. LIBERATORS: FIGHTING ON TWO FRONTS IN WWII, produced with William Miles, is a feature documentary about all-Black 761st Tank Battalion and 183rd Engineering Corps in World War II who fought in the segregated US Army and helped liberate Nazi concentration camps. THROUGH THE WIRE is a feature documentary, for theatrical and public television release, produced in association with Amnesty International about small group isolation in the High Security Unit in the Federal Prison in Lexington, KY, and the international movement to shut the unit. AMERICA AND LEWIS HINE is an award-winning feature documentary about pioneer social documentary photographer Lewis Hine, who documented immigration at Ellis Island, immigrant life on the Lower East Side, child labor, the construction of the Empire State Building, and men and women at work from 1905-1940. Lewis Hine's work helped establish child labor legislation and is a vital part of the historic record and a cherished part of our national heritage. FILMS ARE AVAILABLE FOR EDUCATIONAL AND LIBRARY PURCHASES, AS WELL AS CLOSED CIRCUIT EDUCATIONAL TELEVISION.